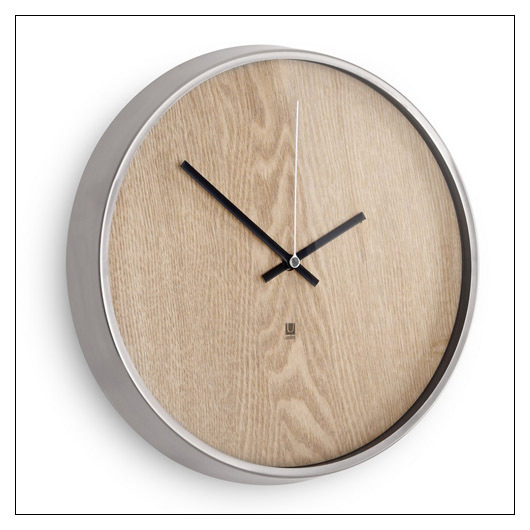 Umbra Madera Wall Clock (UMMADERA) at Pure Design / Accessories / Clocks ::: Furniture for the Home, Office, Home Office, and More at Pure Design Online! This clock has a classic look. Available with a natural stained veneer face and nickel rim, or ashwood veneer face with a walnut stain and an aluminum rim with indicators on the glass. Its clean numberless appearance will look perfect in any room.